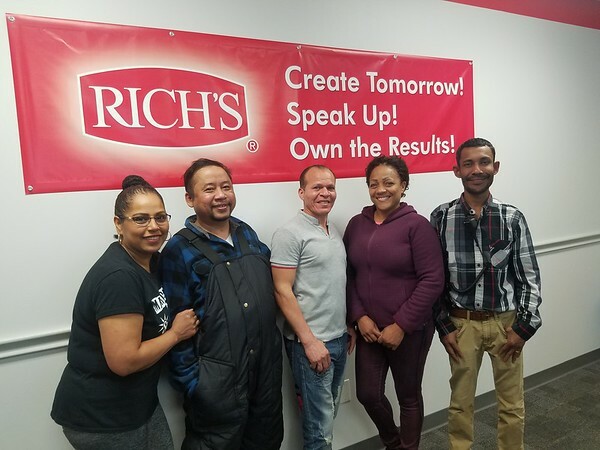 NEW BRITAIN - Literacy Volunteers of Central Connecticut has a partnership with Rich’s Products Corporation to teach English to their employees. Rich’s has a diverse team of employees who, combined, speak over 10 languages. For some of them, English is not their first language, which has caused communication challenges. To bridge the communication gap, Literacy Volunteers of Central Connecticut partnered with Rich’s. Since January, a group of ten employees from Rich’s have been taking English classes during their work schedule. Classes are twice a week, one hour each. The classes are meant to help the workers with general English, work terminology, and life skills. The classes are scheduled to last a year and Rich’s plans to offer classes for a new group of employees when the current group completes their courses. Simao also said that this program of classes is working out really well. Students have been tested for progress using the State’s Adult Education Test. In addition, she said that each student was tested before classes started so that the volunteers could create a curriculum tailored to the student’s individual needs. “That’s one of the advantages of the program that we have. Our program is very student centered so we are always adapting to the needs of the students and what the need of the employer is as well,” Simao said. Alyssa Czopor, human resources manager at Rich’s, said that employees have potential to learn and grow within the company. Students said they are happy they have this opportunity, adding that the teachers are helpful. Aurelis Rodriguez is one of the workers taking the classes. She is a decorator lead, and as part of her job, she has to constantly communicate with her co-workers. Since her English is very limited, she is happy she got involved in the class. Rodriguez said she loves her job, which is why she is looking to get better at it by learning language skills. Simao said that Literacy Volunteers of Central Connecticut have a goal of reaching out to other companies in the area that have the same kind of language barriers. For more information about the programs offered by Literacy Volunteers of Central Connecticut, call 860-229-7323. Posted in New Britain Herald, Business, New Britain on Monday, 11 June 2018 11:02. Updated: Monday, 11 June 2018 11:04.